Road taxes and fees will not be spent on social programmes. The Ukrainian parliament on 17 November voted to establish the State Road Fund as part of the special fund in the the state budget. One of the sponsor of the bill, MP Yaroslav Dubnevych wrote in his blog on LB.ua that revenues from the payment of excise duties on oil products and other taxes and fees, aimed to be spent on the Ukrainian roads, will be channelled to the Road Fund bypassing the national budget to avoid spending of the revenues on the current needs. 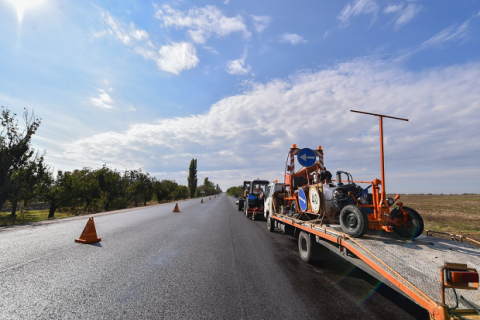 According to the estimates of the authors of the bill, the size of the Road Fund revenues will amount to 30 to 40 billion hryvnia annually provided all special taxes and fees are properly paid and collected. The bill suggests that the Road Fund should be replenished from excise tax imposed on Ukrainian-made and imported petroleum products and motor vehicles; an import duty on petroleum products, vehicles and tires, road toll, and concession fees. To avoid unbalancing of the national budget's general fund, the parliament decided to delay the entry into force of the bill to 2018 and provide a transition period for the fund's replenishment. By 2018, 50% of the nation's revenues from excise taxes and import duties will go to the Fund, in 2019 - 75% and in 2020 - 100%. 60% of the State Road Fund will be spent on construction, reconstruction and repair of national public roads, 35% will be earmarked for local roads, and 5% will be used for the financing of road safety.